Westfield Football Club has won the December team of the month award in its division. 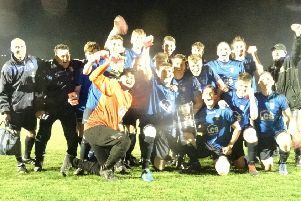 The Westies claimed the latest monthly honour in Macron Store Southern Combination League Division Two following a remarkable end to 2017. More action from Westfield's win against Rottingdean Village in their last outing. Westfield won all four of their matches last month, scoring 21 goals and conceding none in the process, rising to sixth in the table to boot. They won 6-0 away to Clymping and 5-0 at Jarvis Brook, while the home games produced a 2-0 victory against Upper Beeding and an 8-0 thrashing of Rottingdean Village. Those results were made all the more impressive given that Westfield’s two fixtures in November ended in 4-0 and 4-2 defeats, against Cowfold and Lancing United respectively, and they lost a couple of key players to boot. “It was coming to the point where you start doubting yourself,” continued Stapley. “There was a strong conversation in the changing room afterwards and everyone said it can’t continue. Maybe it was a blessing in disguise that result; since then it’s brought out the best in everyone. Westfield’s momentum was stalled slightly by the postponement of their scheduled trip to fourth-placed Sidlesham last weekend, but they will hope to be back in action at home to second-bottom Clymping this coming Saturday. Kick-off at The Parish Field is 2pm. “It’s a long way for them to travel and they’ve not played a lot recently, but they’ll be chomping at the bit I think to avenge the result we had down there and they’re a side that can cause a threat,” added Stapley. Asher Grindle and Josh Carey should be fit after illness, but Aaron Cochrane is out having pulled a muscle in his quad in the Rottingdean game.